Pink Sea Urchin (ea.) 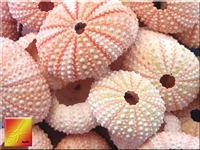 1 1/2-2"
Beautiful Pink Sea Urchin Shell. Color Range: very light pink (almost white) to deep pink.